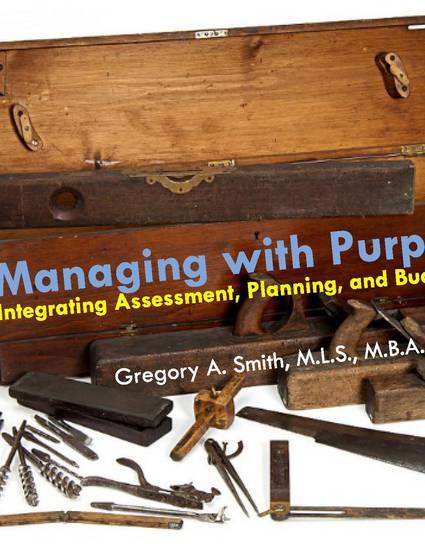 "Managing with Purpose: Integrating Assessment, Planning, and Budgeting"
Assessment, planning, and budgeting are interrelated disciplines that play an important role in accomplishing a library's mission. This conference session introduces tools and concepts that will equip attendees to manage library services strategically in response to evolving customer needs and environmental conditions. Four tools—the logic model, six dimensions of assessment, the balanced scorecard, and the business model canvas—will enable managers to evaluate, plan, and communicate progress in the pursuit of mission and vision. Additionally, two concepts—opportunity cost and the principal-agent problem—will provide context for planning and budgeting decisions. A presentation made at the annual conference of the Virginia Library Association, Hot Springs, VA, 27 October 2016. Workshop slide deck and bibliography are available here.